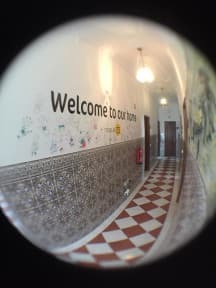 Hostel 33 v Faro, Portugalsko: Zarezervujte nyní! Hostel 33 belongs to a team of Portuguese experts working in the field of tourism for more than 15 years. Our aim is to make you feel as if you were visiting the home of a Portuguese family. Hostel 33 is housed in a 60-year-old building, completely renewed but keeping its background inside and outside with vintage furniture, chandeliers and the famous Portuguese tiles! Our mixed rooms are on the ground floor, very spacious and decorated with relaxing colors. The major bathroom has space for 2 showers simultaneously, besides the second option on the same ground level. If you want more privacy, we suggest you our double rooms on the first floor, all with private bathroom, and each of them with an outdoor terrace where you can enjoy our delightful sun's light. We are outgoing people, we like to socialize and to share experiences with you, so do come and sit in the lobby for a while, to chat, to read a book from our 'book swap library', to check the latest news on our info board... and to eventually join us and our other guests for a glass of Portuguese wine. And what to say about Faro town, the capital of our province, where we are located? Definitely the best and most central spot to star your visit in the Algarve. Ten minutes by car from the airport as well as from the beach where you'll have multiple choices in water activities: canoeing, body boarding, windsurfing, and also taking walking or cycling tours on our nature trails of the Ria Formosa. You'll end up extending your stay here! Your presence is our pleasure, and we're sure that you'll feel like 'I must go back'!